SUBSCRIBE ON ITUNES, GOOGLE PLAY, STITCHER AND iHEART RADIO! 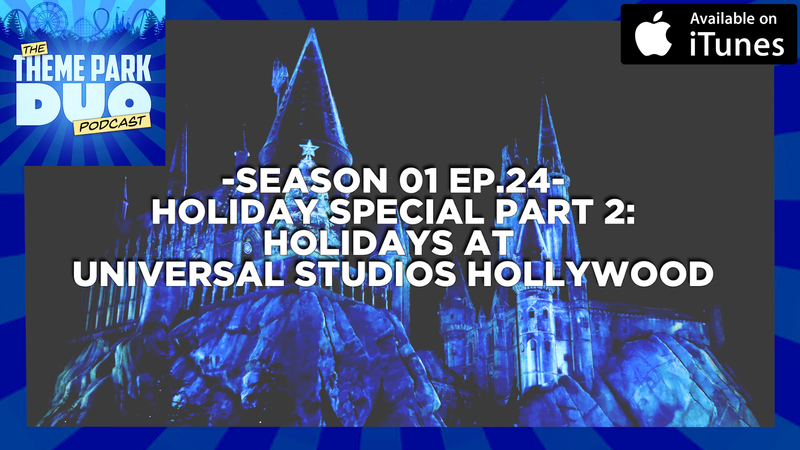 On this Episode of The Theme Park Duo Podcast, The Duo talk about their adventures at Universal Studios Hollywood for their Holiday celebrations! This includes Grinchmas with the Grinch himself and his trusty dog Max! As well as a magical (Not just in the Holiday sense) visit to The Wizarding World of Harry Potter for Christmas in the Wizarding World and The Magic of Christmas at Hogwarts Castle show. Everything was just so perfect and unique that they cannot wait to share it. Not only that, but The Duo reveal who their SUPER SECRET special guest will be on their Season Finale. And last but not least, it may be Nikki’s turn to get a pie in the face, if we get enough reviews! All of that and so much more (tangents) on this holiday special episode!